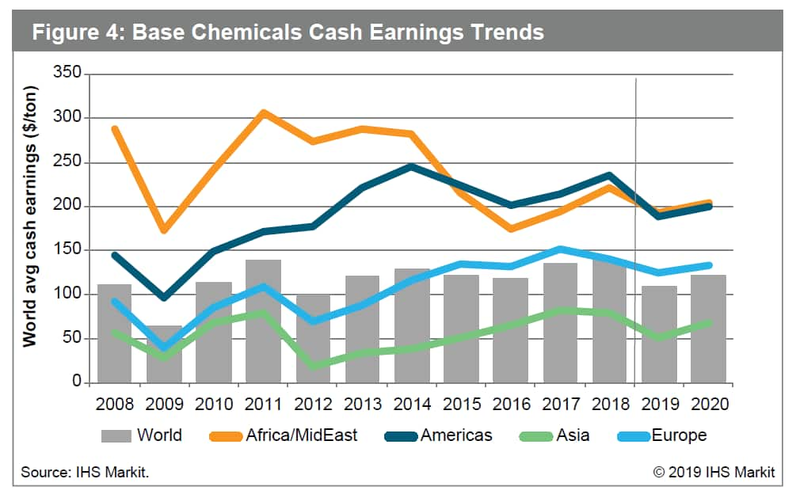 The global basic chemicals industry has been experiencing an extended up-cycle, characterized by record levels and steady demand growth, and above-reinvestment level profitability during the past four years. 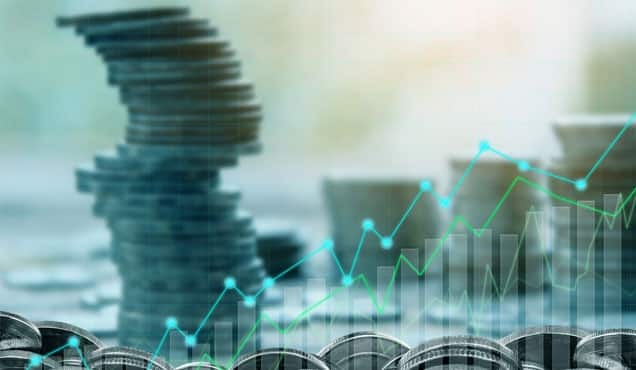 In early 2019, the strong growth and elevated profitability appears to be threatened by developing economic headwinds at the same time a wave of new capacity prepares to start-up. Basic chemicals for this discussion include ethylene, propylene, methanol, benzene, paraxylene, and chlorine. These six chemical products represent the basic building blocks from which a significant amount of durable and non-durable consumer goods are produced. Roughly half of these chemicals are converted into plastics materials, which have been a primary growth engine for the chemical industry for decades. Plastics represent one of the foundations of modern living, enabling basic needs such as clean water and fresh food to everyday items such as smart devices, sporting equipment, auto parts, appliances, clothing, and footwear. These consumer items are more durable, lighter, energy efficient, and environmentally sustainable thanks to plastics. 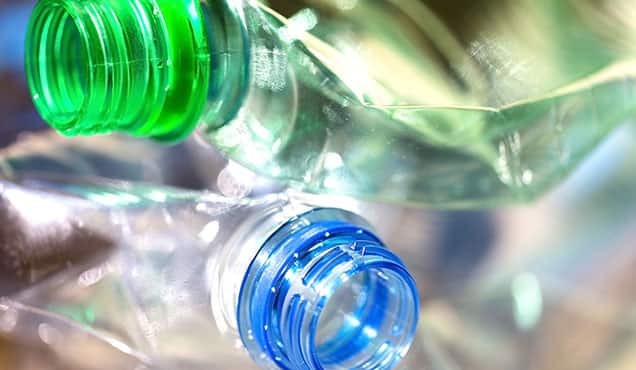 Demand for commodity plastics (such as polyethylene, polypropylene, polyethylene terephthalate, polystyrene, and polyvinyl chloride) in 2018 is estimated at 255 million metric tons, representing about 50% of basic chemicals demand. 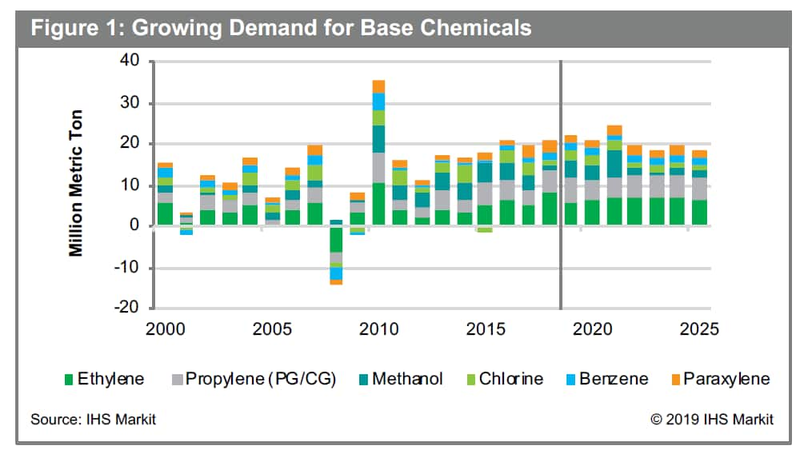 IHS Markit estimates that total basic chemicals demand in 2018 increased to 515 million metric tons, a 20-million metric ton increase over 2017 total demand (see Figure 1). 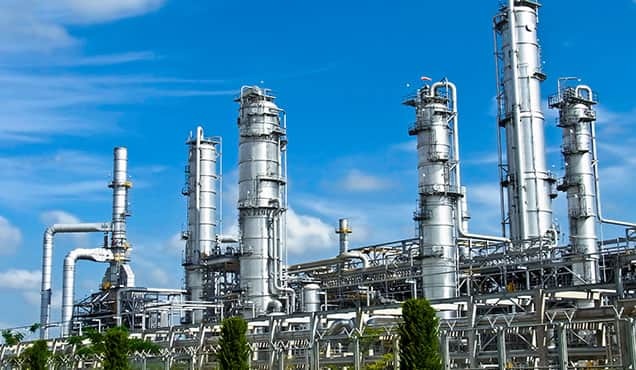 The strongest growth (in 2018) was reported in the ethylene (8 million tons), propylene (5 million tons), benzene (1.6 million tons), and parax-ylene (3 million tons) markets. Starting in 2015, basic chemicals demand growth averaged 19.6 million metric tons per year, being fueled by a global economy that has been expanding in recent years at an annual rate of more than 3%. For the past three years, all major regions of the world have been growing and urbanization is on the rise. This combination results in strong consumer spending on durable and non-durable goods. Steady and strong global economic growth has been the single most positive factor influencing strong demand growth for basic chemicals for the past four years. 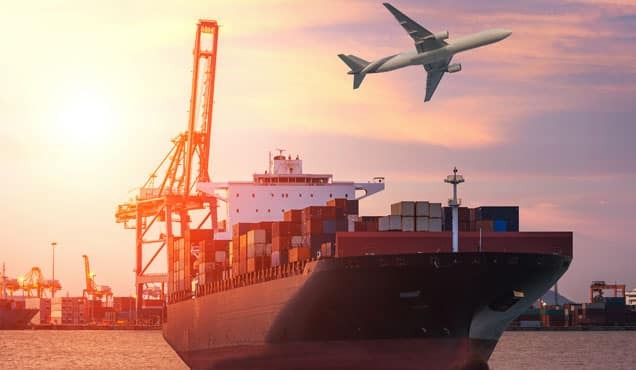 However, at the end of 2018, and continuing into the early months of 2019, major headwinds began threatening to slow global economic growth, which in turn will impact the demand for basic chemicals. Energy volatility (crude oil pricing), currency fluctuations, protectionist trade tariffs, and an endless list of geopolitical uncertainties - from US-China trade and Brexit, to political turmoil in Europe, Middle East, South America, and the US - create uncertainties that cause businesses and consumers to become more conservative with their investments and spending. 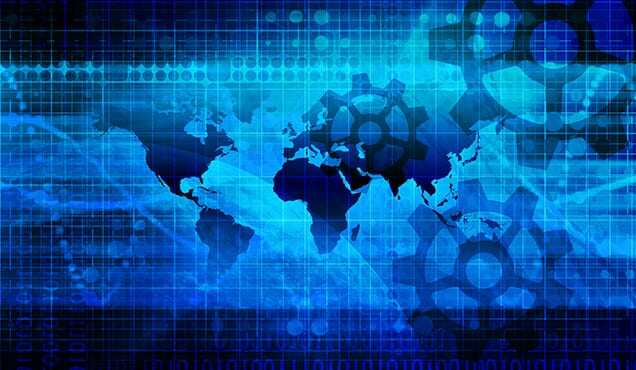 If global economic growth begins to slow, it will occur at a time when new capacity start-ups across most basic chemicals value chains will begin to be felt in the market. 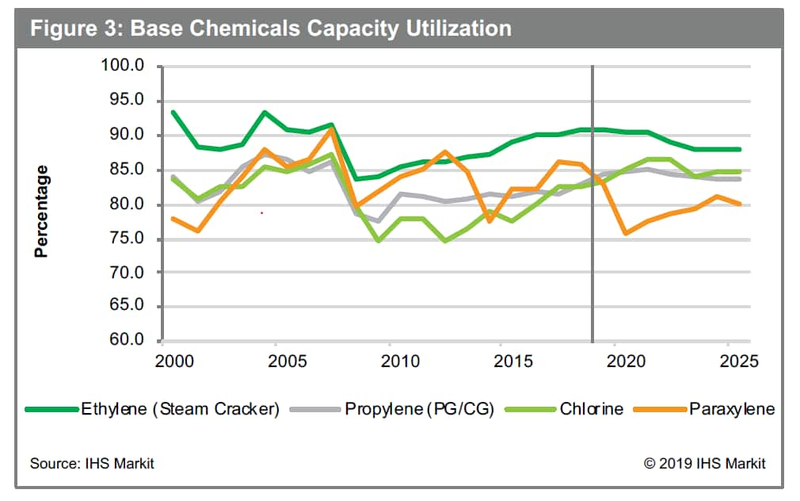 In markets such as paraxylene, capacity additions will overwhelm demand growth even under strong growth conditions. If new capacity growth combines with a slowdown in demand growth, the resulting oversupply scenario will significantly affect industry profitability. In addition to the threat of slowing economic growth, in 2018 the issue of plastics waste was thrust into the global spotlight. It is now threatening long-term demand growth for the chemical industry. The growing demand for plastics has created an unexpected and serious waste problem, as it is estimated that 8 million metric tons of plastics waste ends up in the oceans every year. Consumers and governments are responding to the visibility and enormity of the plastics waste problem by often supporting bans and de-selection initiatives that impact potential growth in the future. The industry has been responding to this issue for many years. The effort was accelerated in 2018, as more producers and brand owners pledged resources to support global efforts to clean up plastics waste in the environment and fund research that will develop economic and sustainable solutions for managing plastics waste in the future. Long-term forecasts for chemicals demand growth must now include scenario analysis that evaluates the impact of plastics waste issues in the future. GDP elasticity is a measure of the rate of growth in a market (such as propylene) relative to global GDP growth. 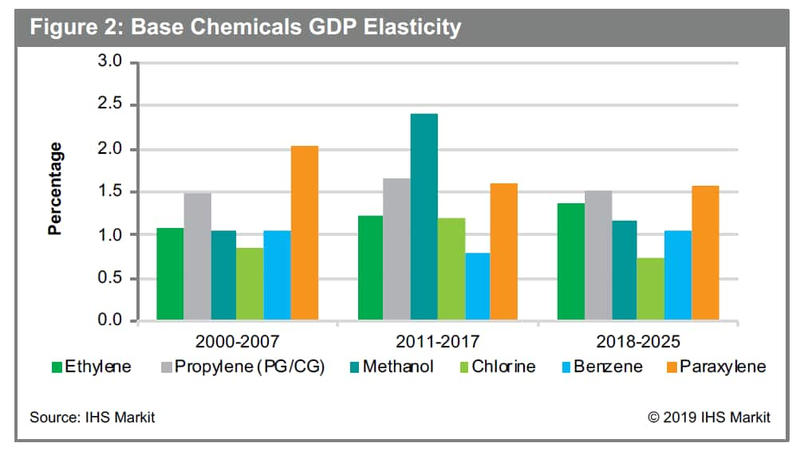 For example, propylene GDP elasticity, represented by the gray bars in Figure 2, is sustained at 1.5 or higher. This means that global propylene demand has been growing at a rate of 1.5 times global GDP growth in the period from 2000 to 2017. IHS Markit is also forecasting this growth level will be sustained from 2018 through 2025. The forecast results in an average demand growth for propylene of more than 5.0 million tons per year (or an average of more than 4% per year). Five of the six basic chemical markets are forecast to grow at a rate equal to or above GDP for the near term. Chlorine is forecast to be constrained by a lack of new investment in the near term. 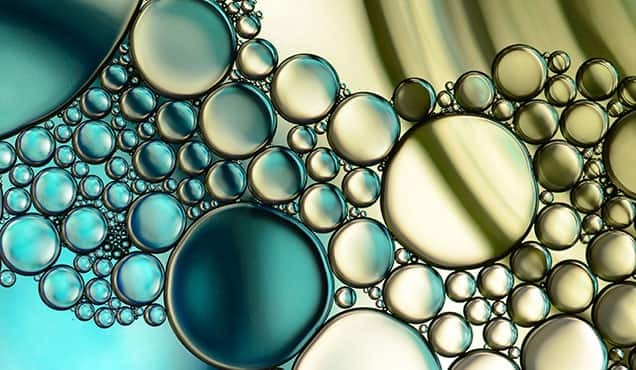 During the period 2019 to 2020, the new basic chemicals capacity being planned for start-up is well-defined. When combined with the IHS Markit base-case forecast for demand growth, the resulting market balances (represented by capacity utilization trends in Figure 3) show continued strength in global ethylene, propylene, and chlor-alkali markets, with weakness developing in global paraxylene that is driven by oversupply relative to demand growth. The resulting forecast of weighted average cash earnings by major region (see Figure 4) projects a slowdown in industry profitability compared to the last two years. That resulting profitability forecast includes not only the assumptions for supply-demand, but also the IHS Markit forecast energy and feedstocks. Also, it assumes no surprises from a geo-political perspective. 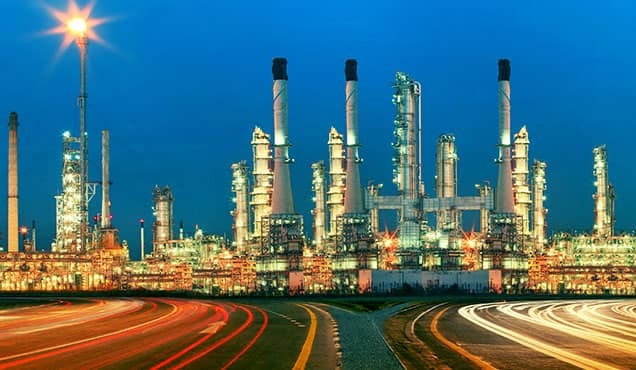 All four major regions are forecast to see a decline in profitability as oversupply in key markets forces chemicals and derivative prices lower in the face of steady or higher energy and feedstock costs. The important question to ask when assessing the near-term forecast is where are the most significant risks? Are they in supply? Demand? Energy? Economy? Geo-politics? While one would conclude today that the "consensus sentiment" in the industry seems to lean towards a decline in profitability over the next few years, there remains a chance that continued strong economic growth combined with supply-side interruptions could enable the upcycle to continue. If such a scenario develops, is your organiza-tion ready to capture the opportunity and the related profits? IHS Markit fully integrated analysis connects energy and economic outlooks directly with the forecast of supply and demand. It can help companies develop scenarios for their own businesses, enabling scenario planning that will allow your organization to respond to risks and opportunities as they arise.